Serpentine is Latin for snake and one of its main properties is to open new pathways for the Kundalini to rise. Kundalini is referred to at times as the sleeping serpent. It's positioned at the base chakra were it lies waiting to be awakened. According to some, there are many symptoms associated with the rising, or there are barely unnoticeable changes. It just depends on the individual. For me it began with pain in the lower back, right at the tail bone. At first I thought that I had injured myself by picking up a box at work incorrectly, but with further investigation found that to be untrue. So with that in mind, programming the serpentine to release its energy gently worked for me. 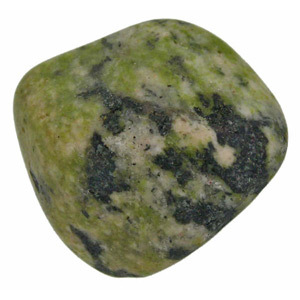 Serpentine helps to clear all chakras plus stimulate the crown chakra. By moving serpentine over the chakras it clears any cloudy energy. Serpentine has a very old memory. It links into the ancient wisdom and knowledge. The retrieval of this information can assist in understanding our past lives, and provide spiritual insight into our existence. Because of this attribute serpentine has been classified as a "stone of longevity". Serpentine offers protection from poisonous creatures, snakes, spiders, and other troublesome reptiles and insects. So it is recommended that if you enjoy the outdoors, carry a piece with you to keep harmful nasties away. Seals made of serpentine were carried in ancient Assyria so the gods and goddess would send double blessings. Serpentine is also worn around the neck by nursing women to regulate their milk supply. It eliminates parasites, aids calcium and magnesium absorption and treats hypoglycaemia and diabetes. "In ancient Hindu mythology, the Goddess Kundalini, one incarnation of the Great Mother deities, was represented as a serpent sleeping coiled at the base of the spine. As a symbol of our connection to the Divine Feminine, the energy of Kundalini lies waiting at the base chakra. For the soul to fulfil its highest potential, the Kundalini energy must rise upward through the chakras toward the Divine Masculine of the crown chakra. This union of the feminine and masculine is also the joining of the creative and the sexual energies." Extract from Auras and Chakra, harnessing the energy within, by Fiona Toy. Since serpentine relates to snake hence the name, and Kundalini relates to serpent, I felt it appropriate to add some information in reference to its animal symbolism. Taken from Ted Andrews 'Animal Speak': "Snakes are symbols of transformation and healing. Because it sheds its skin, the snake has long been a symbol of death and rebirth. It sheds its skin as it outgrows the old... This is associated with higher wisdom that comes with the passing of time. Before the snake begins to shed its skin, its eyes will begin to cloud over. It gives the snake a trancelike appearance. To many mystics and shamans this indicated the ability of the snake to move between the realms of the living and the dead, of crossing over form life to death and then back to life again. As the skin begins to shed, the eyes begin to clear as if they will see the world anew. For this reason, alchemists often believe that wisdom and new knowledge would lead to death and rebirth, enabling the individual to see the world from an entirely new perspective."